BANCASI, Butuan City – Army’s 29th Infantry (Matatag) Battalion under 402nd Infantry Brigade, Philippine Army battled members of CPP-NPA terrorists (CNTs) in Sitio Patagon, Brgy Anticala, Butuan City at around 1:30 p.m. on January 27, 2019. While responding to the reports from the local community of NPA terrorists extorting from the people, the government troops encountered an undetermined number of CNTs believed to be under Toto Anub alias Dongkoy/Makoy at Sitio Patagon, Brgy. Anticala, Butuan City. 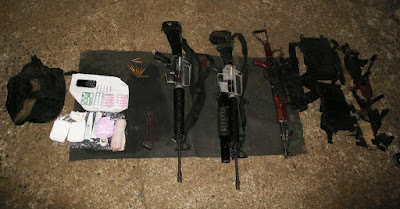 The firefight lasted for about ten minutes after which the enemy scampered to different directions leaving three dead NPAs, one AK47 rifle, two M16 rifles, and one M203 grenade launcher. The dead bodies are yet to be identified and will be turned over to the Brgy. officials and PNP personnel for identification and proper disposition. "We extend our deepest sympathies to the families of those killed. It is disheartening that NPA terrorists will just leave their dead comrades behind. We will coordinate with the local government unit and local authorities to ensure that the slain CNTs will be delivered to their respective families for proper burial," Lt. Col. Warren Munda, Commanding Officer of 291B said. In the statement of BGEN FRANCO NEMESIO M GACAL AFP, the Brigade Commander of the 402nd Infantry Brigade, he said that they strongly condemn the extortion of the CNTs victimizing innocent civilians. "The CNTs are preparing for their 50th NPA anniversary at the expense of the innocent civilians. We appreciate the overwhelming support of the people in tipping-off the presence of CNTs just like what happened in Brgy Payapag, Bacuag, Surigao del Norte last January 25 that also resulted in a clash and death of two (2) NPAs. This is a clear indication that the people are already fed-up with the CNTs’ decades-long of banditry and extortion. There will be no let-up in our offensive operations against the CNTs. We will hit them and we will hit them hard," he added.